Jules Chéret was born 1836 on May 31 in Paris. Since his family was poor Jules had to end his studies at the early age of 13. He was then sent to a lithographer by his father, for a three year apprenticeship training to learn the trade alongside a master craftsman. 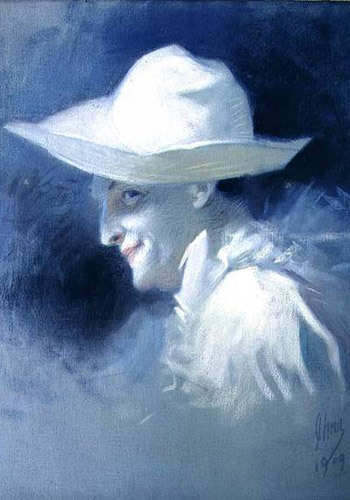 He took an interest in painting which eventually led Jules Chéret to École Nationale de Dessin, where he signed up for an art course with his master Horace Lecoq de Boisbaudran. There he also visited the Paris museums and observed the techniques of many past and present artists. Even though he did well in Paris by working for a multitude of music publishers Chéret felt there was other things ahead of him. He went to London where he did drawings for ‘The Maple Furniture company’ all the while he was trying to ignite his artist career. He practiced lithography between 1859 to 1866 . There he was also influenced by the British style of Poster design. It was hard and trying times for him as for many artists and he had to go back to Paris with no more funds than what he had left with. 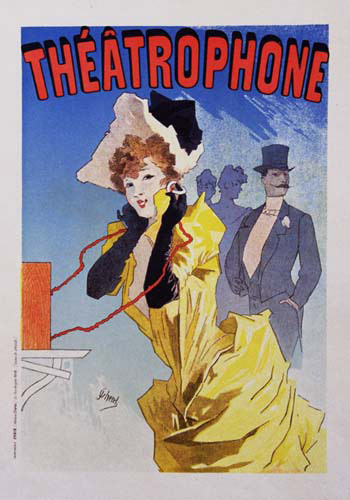 When he eventually went back to France, he was commissioned to make colorful advertisements for theaters and music halls. His lists of clients included train-companies, touring circus troupes, cabarets, actresses, plays etcetera, and he also did ads for soaps, perfumes and beverages to mention just a few examples. Advertisements like this was a new thing at the time and these works would lead him further. 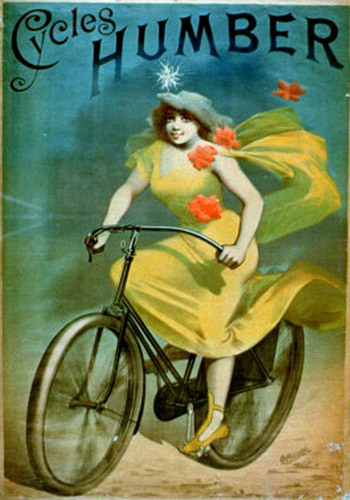 Needles to say Jules Chéret posters had become a strong and much sought after force in advertising. By some he was now called ‘The master of the Poster’. Large presses were imported to Paris from London and lithographs in color would now be a reality made by Jules Chéret in Paris. 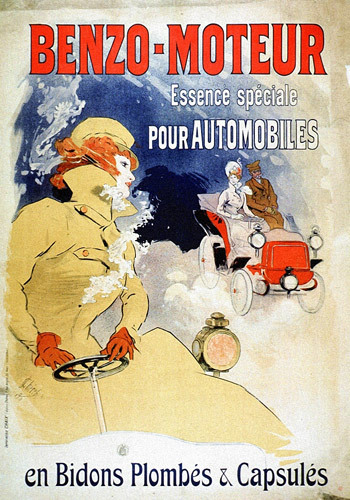 At this time Jules Chéret was technically skilled as well as artistically. He even started with a new way of printing which enabled him to print in more than the usual two colors. 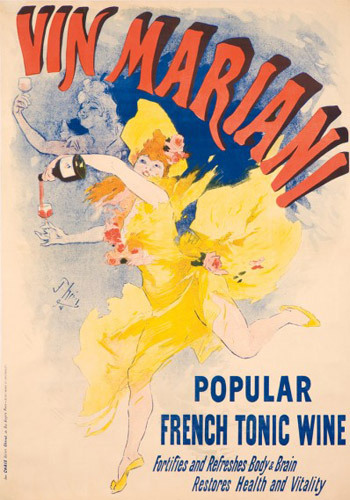 This method was the start of the color lithographic poster and no artist before him had achieved what he did. His way of using complementary colors brought awe to Pointillists and Impressionists alike. 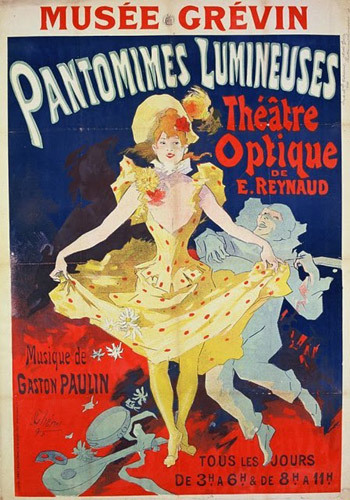 With his clever lithographic process he achieved a great balance of vibrant colors in perfect unison with the others brilliant hues and his prints displayed a fine and fluid gracefulness in a unique and delicate way. 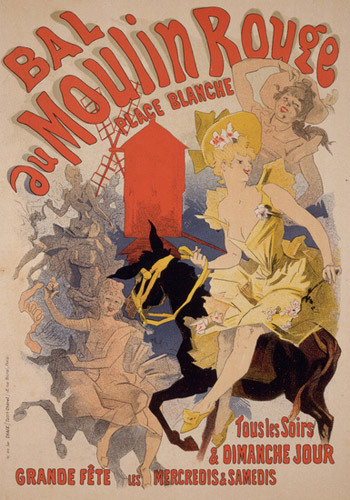 Jules Chéret made his first poster for the Moulin Rouge, called “La Goulue” in 1891. 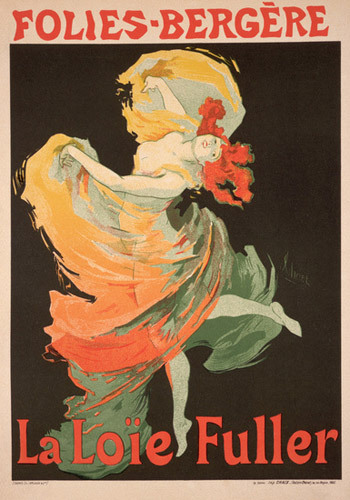 He became well known for the voluptuous beauties of the Moulin Rouge dancers which were often the subjects of Jules Chéret’s posters which all beautified the streets of Paris. Joyous, flirty, colorfully vibrant whirling dancers was seen all over on Kiosks and other locations throughout the city. Some even entitled him “father of the women’s liberation”. Cheret often visited museums watching the art of Rubens, Tiepolo, Watteau, Turner and the likes, were all great inspirations to Chéret. 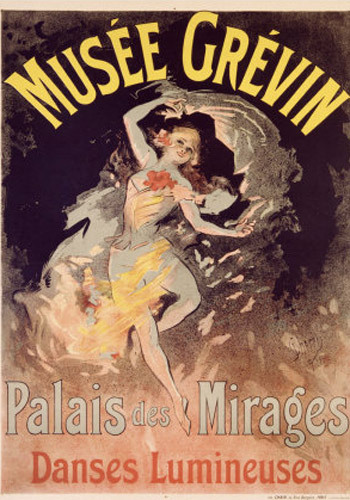 Some of his most well-known pieces include ‘La Danse de Feu’ which means “The fire dance”. 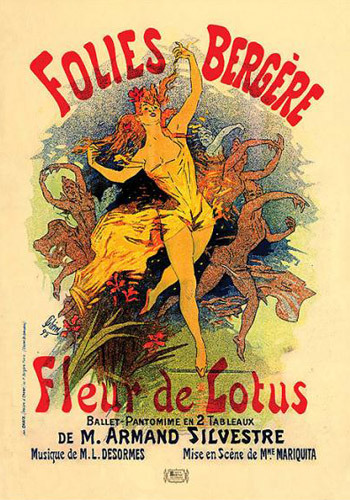 It depicts a dancer named Loie Fuller who performed at Folies Bergene. 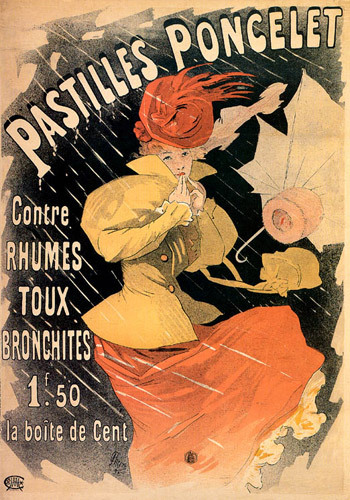 He also made plenty of posters for ‘Moulin Rouge’. 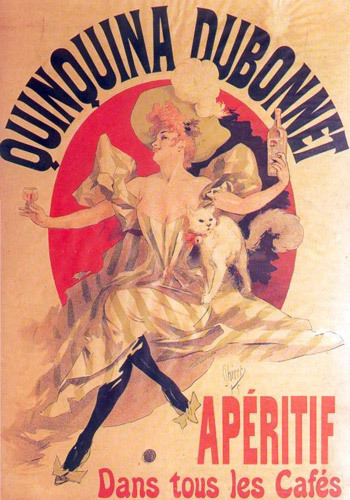 Another famous poster is of Yvette Gulbert from the Concert Parisien. She was known for almost always wearing long and dark-colored gloves. Decorative panels were made with the purpose of beautifying homes rather than the usual advertisements. 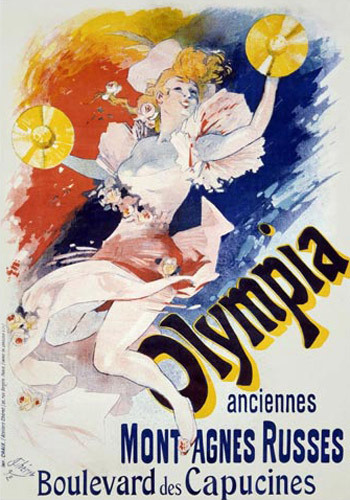 The ones he created were ‘La Musique’ (1891), ‘La Comedie’ (1891), ‘La Pantomiene’ (1891), ‘La Danse’ (1891), ‘La Fileuse’ (1900) and ‘La Dentelliere’ (1900). 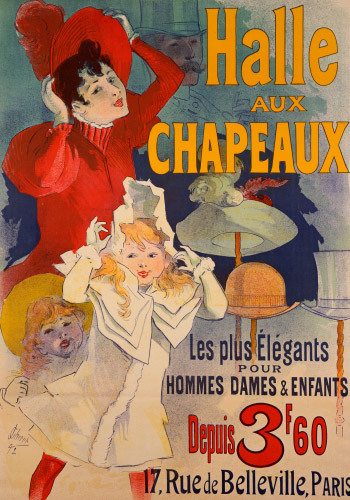 By the year of 1881 the art of Jules had become so well known and so much in demand that, while still having artistic control, he was able to move most of the responsibilities of the shop to ‘Chaix & Company’. 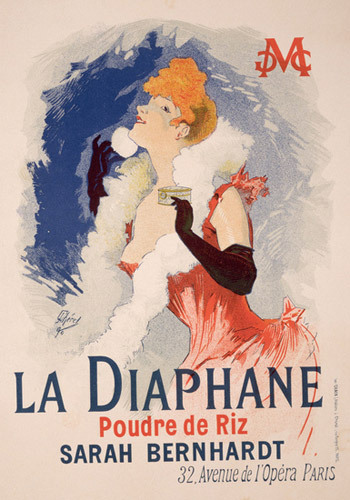 The French Governemtn awarded him the ‘Légion d´honner’ in 1890 for his amazing part in the evolution of the graphic arts. As he came to an older age Jules spent more and more time in the nice climate of the French Riviera in Nice. He suffered from loss of vision in 1925 but he was often seen with his wife, walking along the alleys of beautiful Nice. 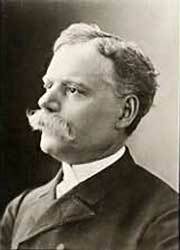 He died 1932 on September the 23:d. Jules reached the respectable age of 96 years. A year later the exhibition of his work ‘ was held at the highly regarded Salon’s Exhibition – Automne in Paris. 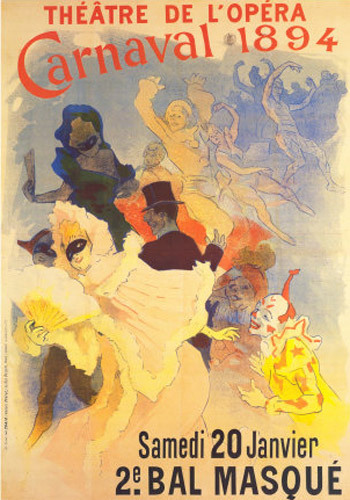 Over time the Jules Chéret Posters has become very much in want by art lovers all around the globe. Although he started is life with poor means he came to be a man whose art gave joy and beauty to millions of people. 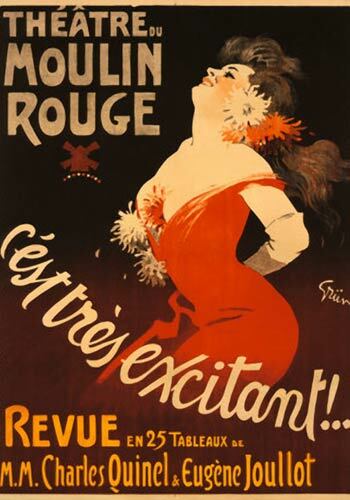 Did you enjoy this web-page about Jules Chéret Posters? Please pass it on to others using the share-tools below, or share your own thoughts in the comments section.